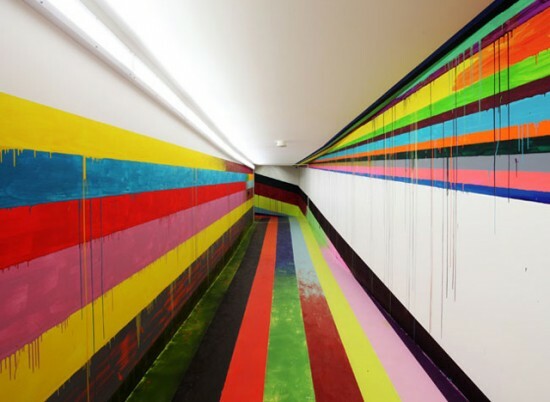 The German artist Markus Linnenbrink created an incredibly colorful journey in a tunnel in a prison in Duesseldorf (Germany), where visitors pass through to see their friends and loved ones. If you take a took at the images you get a sense of the space. 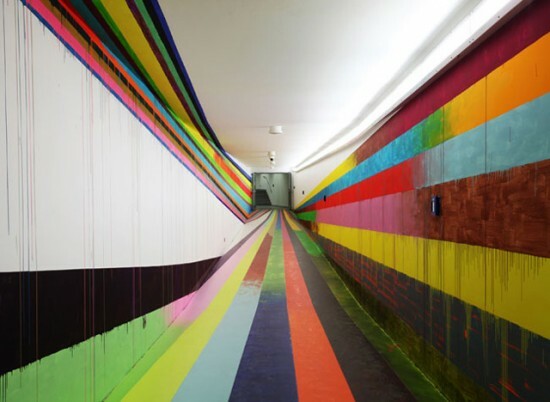 Imagine what the tunnel must have been like before the transformation: a claustrophobic, long winding space with monochrome white walls and those ultra functional yet hideous neon lights. What a depressing expereince it must have been for the visitors. The new tunnel is so much more interesting, inviting and playful. It nearly makes you forget where you are. 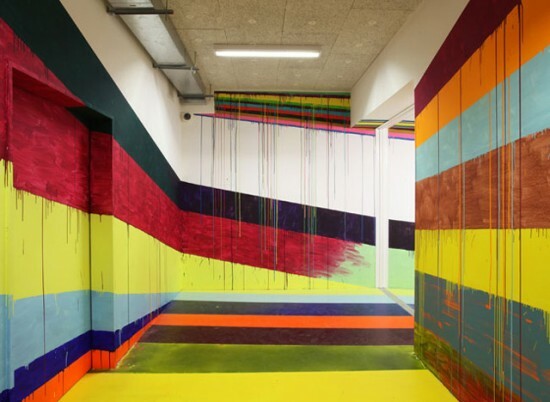 I like especially the juxtaposition of the graphical use of the colour with the the roughness of the dripping paint. 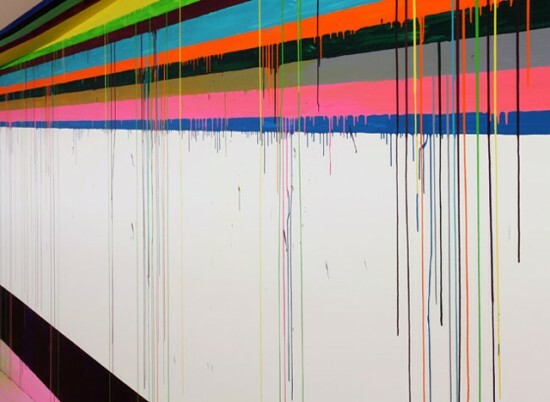 The paint drips feel like imperfections that really make the experience more human, and playful, and less “academic”, allowing visitors who might otherwise be intimidated by the art work, access to the piece more easily. And even if you don’t care at all about art, these new walls are bound to improve the overall prison experience for the visitor. It must be hard enough having to go through this ordeal. 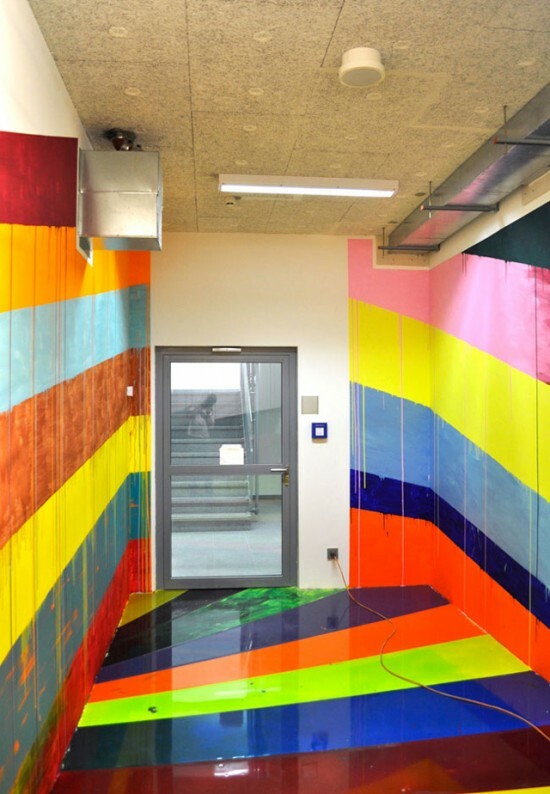 Why not look for ways to improve a dire situation using art as a catalyst. I love it when art improves people’s live with such simple means. 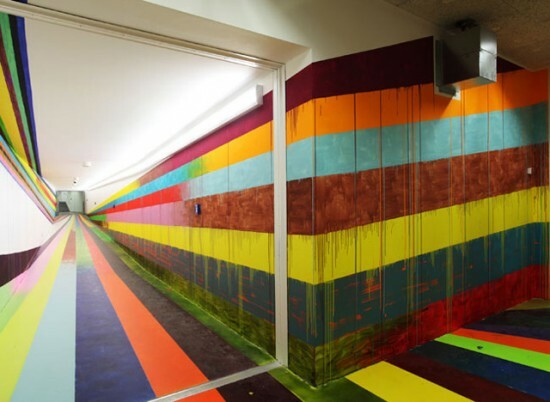 I hope this example will inspire other decision makers to think of ways to improve an often neglected environment. If you have any other examples, comparable to this one, please let us know. You are currently reading Experiential Design In Prison at Brand Experience Strategies & Cultured Projects.